Expressive writing is a powerful method to help people get through difficult times. It strengthens their immune systems as well as their minds, by assisting people to manage and learn from negative experiences. Writing is no stranger to therapy. For years, practitioners have used journals and other writing forms to help people heal from stress and trauma. New research suggests that expressive writing may also offer physical benefits to people battling terminal or life-threatening diseases. 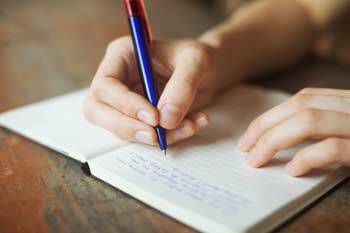 Studies by psychologists James Pennebaker, Ph.D., the University of Texas—Austin, and Joshua Smyth, Ph.D., Syracuse University—suggest that writing about emotions and stress can boost immune functioning in patients with such illnesses like HIV/AIDS, asthma, and arthritis. Researchers are now beginning to understand how and why writing benefits the immune system, and why some people appear to receive more help than others. There is agreement that the key to writing’s effectiveness is in the way people use it to interpret and understand their experiences, and even the words they use. Venting is not enough to relieve stress, and thereby improve health. To tap into writing’s healing power, people must use it to reflect on and better understand and learn from their emotions, Smyth says. A groundbreaking study of writing’s physical effects appeared in the Journal of the American Medical Association (Vol. 281, No. 14) In the study led by Smyth, over one hundred asthma, and rheumatoid arthritis patients wrote for 20 minutes on three consecutive days—seventy-one of them wrote about the most stressful event of their lives, and the rest wrote of the emotionally neutral subject of their daily plans. Four months after the writing exercise, seventy patients in the stressful-writing group showed improvement on clinical evaluations compared with thirty-seven of the control patients. Also, those who wrote about stress improved more and deteriorated less, than control groups for both diseases. “So, writing helped patients get better, and kept them from getting worse,” says Smyth. Pennebaker says, “By writing, you put some structure and organization to those anxious feelings,” he explains. “It helps you to get past them.” His research indicates that suppressing negative, trauma-related thoughts compromises immune functioning and he found that those who write visit the doctor less often. However, Pennebaker says, “People who talk about things over and over in the same ways aren’t getting any better,” he says. “There has to be growth or change in the way they view their experiences.” In My memoir, Through It All: A Memoir of Grief and Loss, the lessons I learned was the reflections of the good the experience provided. The language people use is evidence of their changed perspective. I provide a list of lessons I learned by reflecting on my experiences. Pennebaker found the more people use such cause-and-effect words like “because,” “realize” and “understand,” the more they appear to benefit from writing. Writing my memoir was a healing journey. Pennebaker acknowledges that some personality types likely respond better to writing than others. Evidence suggests that people who are unable to speak freely benefit most. A host of other individual differences like handling stress, ability to self-regulate, and interpersonal relations—all restore harmony and balance and the effectiveness of writing. The power of writing to heal lies in the mind of the writer, that’s where practitioners can help clients tap into their healing power. Writing helps them track their progress in their thinking. The benefits of expressing thoughts and feelings on paper can complement traditional therapy. Therapeutic journaling is any writing or related expressive process used for psychological healing or growth—it can be a beneficial supporting therapy. When integrated into a treatment plan, journaling becomes a dynamic tool for personal growth and healing. Therapeutic journaling and the benefits from its use goes beyond talk therapy. Heddy Keith, M. Ed is a certified journal writing instructor and retired language arts teacher. She offers Journal to the self-workshops and classes in the Milwaukee area. Contact her at Heddykeith51@att.net or call 414-241-2563 for more information.